If you’re technically oriented, particularly if you have a background in electrical engineering, you’ll find gravity control easy to understand. 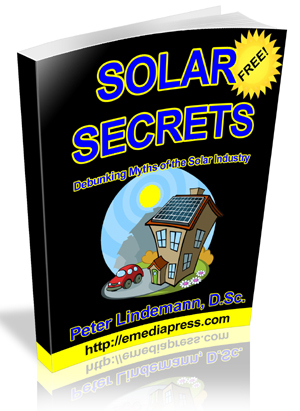 And if you’re familiar with the rocky history of alternative energy development, you will quickly see that gravity control is a gateway technology — not only for easy access to space and a complete overhaul of terrestrial transportation — but for the liberation of free energy technologies. And yet, contrary to expectations, it is likely to be embraced by major corporate interests, simply because it provides a way out of their current problems and into even greater profits in the future. In fact, the profit potential of gravity control absolutely dwarfs anything powering today’s economy. The technology is easy to understand. It begins with a new, physical model of the origin of the gravitational force, which is not provided by Einstein’s general theory of relativity. Dr. Alzofon’s model, which meets all the rigorous requirements of a scientific theory, is based on his experience under professors such as J. Robert Oppenheimer, David Bohm, Victor Lenzen, and Griffith C. Evans at Cal Berkeley from 1942 to 1956, as well as experimental work he conducted at the cyclotron (published in Physical Review). 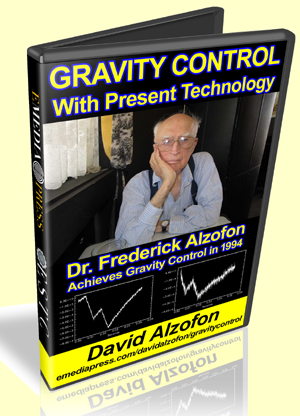 In 1960, an Air Force survey of gravitation research worldwide since the time of Newton concluded that Alzofon’s theory was the only one that had a prayer of a technological application (bibliography in Gravity Control with Present Technology). The only one. Gravity control is easily derived from the model of the gravitational force. The technology resembles a well-known cryogenic process, but operates on a subatomic level on random electrodynamic processes held to be responsible for gravitation. Essentially, it “freezes” (lowers the energy level) of the gravitational field through cyclic application of microwave pulses, which orients the heavy nuclei of paramagnetic materials, such as aluminum. In combination with a constant magnetic field, microwave impulses induce a pumping action that is repeated thousands of times per second, depleting the energy in the gravitational field more and more until a “cascade point” is reached and gravity and inertia vanish almost altogether (the endpoint is comparable to 1/10th of 1 degree Kelvin, by analogy). Since the pumping effects are cumulative, the total energy required to make a vehicle weightless and inertia free is very small (exact calculations are given in the book). 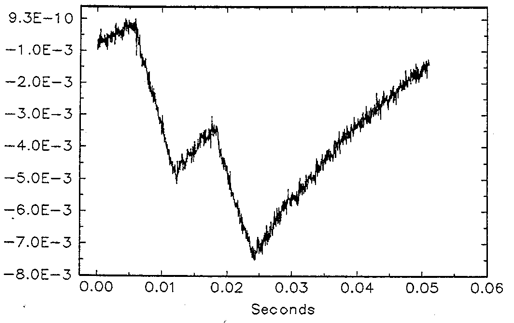 The chart below was computer-generated during the 1994 experiment. The vertical axis tracks weight and the horizontal axis tracks time. The weight began to plummet the moment the system was switched on. Initially we see a slight spike in weight. Then the weight drops. As the cycle repeats, the weight spikes again slightly, but the loss deepens even further after the second spike. This descending saw-tooth pattern was highly significant, as it was predicted in Dr. Alzofon’s model of gravity control before the apparatus was ever turned on. When the power to the system is cut, the weight of the test object slowly and smoothly returns to normal. This occurs as the Earth’s gravitational field, temporarily held in abeyance, returns to disorient the electrodynamic activity surrounding the nuclei of the sample. As you can see, the weight loss is cumulative, not instantaneous. This is the beauty of the technology, because it means a low power investment applied cyclically can be leveraged into a tremendous weight loss in a relatively short time. Think of the implications: Weightless craft will be able to exit the Earth’s gravitational field at any speed, even as slowly as a weather balloon, with very little fuel expenditure. Traditional rocketry, with all of its limitations and drawbacks, flies out the window. This means the conquest of the space frontier and a new frontier for economic development. The same technology can be applied to terrestrial transportation. How would you like to commute to work at Mach 2, with no traffic jams or stoplights? Since inertia is also removed by gravity control, vehicles will be able to stop and start instantaneously, as well as turn on a dime (no g force). And, as millions of people, rather than a few lonely astronauts or well-heeled billionaires, share the experience of viewing the Earth from space, what will happen to our perception of ourselves and our place in the cosmos? Keep in mind that the technology is not theoretical: it was experimentally proven in 1994. After that, Dr. Alzofon kept it a closely guarded secret until his death in 2012. Following his father’s death, David Alzofon — who had watched while the technology languished in obscurity ever since 1981, the date of his father’s full-disclosure lecture in Colorado Springs — decided the time for waiting was over. Humanity could not endure another ten years of the current paradigm, with its built-in spiral of doom, when a new technology was already available that would bring about the dawn of a new age. He correctly saw that there was nothing to fear from the new technology: It would simply evolve on a course parallel to the development of aerodynamic flight, and like aerodynamic flight, it would confer enormous benefits, but on a much, much larger scale. Weaponization? There is nothing destructive about gravity control. Liberating? Yes. Domineering? Not when it is developed equally on all sides. So, abandoning any thought of personal gain, he decided to do all he could to publicize the technology. He opened the books on the 1994 experiment in hopes of encouraging replications of the experiment with improved digital equipment by responsible scientists and entrepreneurs, thereby ensuring its dissemination into the mainstream of science and engineering. Already, there are signs that his strategy is working. And, as he amply demonstrates in the book, if the technology works, the moneymaking opportunities are astronomical. Dr. Alzofon assessed the value of his invention as equal to the combine GDP of all the industrial nations on earth within ten years of its debut. Control of climate change is just a side benefit. Since the dawn of history, gravity and inertia have been regarded as more inevitable than death or taxes. The discovery of gravity control is on a par with the discovery of fire or the wheel. It is not only vitally important for the advancement of science, but for the evolution of mankind, as it opens the door to the final frontier: space.